Share "Adding New Chicks to Your Flock"
Whether you need to replace aging hens, want to increase the diversity of your poultry or just need a few more chickens to meet your needs or increase your profits, you must take great care when adding new chicks to your flock. Fortunately, if you understand the needs of new chicks and the hierarchy of your existing flock, you can successfully help both old and new chickens merge into one happy family. 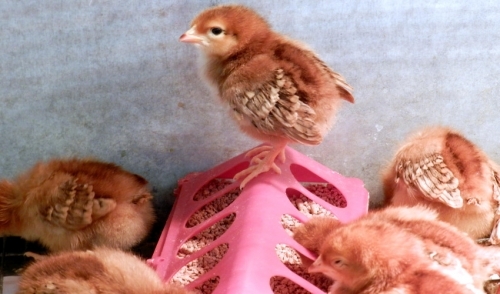 Several difficulties can arise when you try to add new chicks to an existing flock. Because chickens can be highly territorial, adding new chicks will disrupt the pecking order and not only endanger the new flock members, but may cause extra aggression as all the chickens seek to find their best position in the new social order. This can lead to fights, injuries and added stress among all the chickens, which can make them more vulnerable to illnesses. As the coop gets more crowded, any illnesses or infections can spread more quickly, causing more stress among the birds. Stressed chickens are also less likely to lay well, which can impact the productivity of your flock. There are several steps you can take to safely and easily integrate new chicks into your existing flock. Not all chickens get along well together. If you hope to add more chicks to your flock, opt for breeds similar to your existing birds so their personalities won't clash, which could lead to excessive dominance and aggression issues. While young chicks should be disease- and pest-free, it is best to keep new birds isolated for 10-30 days and watch them carefully for lice, mites and signs of illness such as nostril or eye discharges, diarrhea, respiratory trouble and sores. This will keep you from accidentally introducing illnesses to your healthy adult birds. There will be fewer problems adding new chicks to your flock if they are roughly the same size as your adult birds when you introduce them. Equal sizes will minimize hierarchical battles and territorial squabbling that can add stress to your flock or cause injuries. While your new chicks are isolated and growing, you can increase your coop size if needed. An overcrowded coop or run can magnify territoriality and aggression. Diseases will also spread more easily in an overcrowded coop. Be sure every bird will have adequate access to feed and water, as well as enough roosting space or laying boxes to choose from. If your chickens are excessively territorial or you have already thought of moving your coop, now is a great time to find a new location. This will remove territorial markers and all the birds – old and new – will need to explore their new home together, which will reduce their overall aggression. Allow new and old chickens get used to one another before they can actually touch each other by placing two pens side by side. This will allow the birds to see and hear one another before they are in the same coop or pen. Keep these pens separated for 1-2 weeks as the chickens all get to know each other. When you are ready for your chicks to join the flock completely, supervised limited meetings may be necessary. First, introduce the new birds to the pen alone, letting them explore their new surroundings for 20-30 minutes. Then allow the older birds into the pen, but be prepared for minor squabbling as the birds check one another out. These small spats are normal, but if the fighting intensifies, it will be necessary to separate the birds again. After a few of these meet-and-greet sessions, the fighting should cease and the flock is whole. It can take several weeks to successfully introduce new chicks to your existing flock, but if you take the proper steps to do so, all your birds can learn to cooperate and your flock will be stronger and happier than ever.